Description: The "A Musical Study" Collection is unique and a step into Bob's musical past. As a young boy, he had piano lessons and after his move to California in 1968, he took up the guitar. He serenaded his children and on occasion would play at social occasions. The songs he would play and sing would be more atuned to folk songs or songs that told a story - something Olszewski loves to do. Here you will find three excellently chosen pieces he created in miniature hand-painted bronze figurines all less than 1 and 1/2" high. 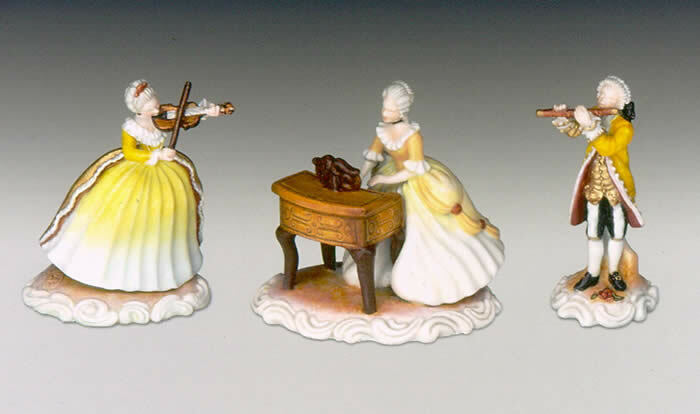 Going from left to right: The Violinist, The Pianist, and The Flutist appear to be all playing a song. Olszewski said he had Vivaldi's The Four Seasons (I quattro stagioni) in mind while he created the pieces. Note how Olszewski picks up the bright yellow and white colors across all of the figurines. The details he exhibits in each piece is worthy of taking the time to view the individual pieces. Click on the names of the pieces here to take you to the individual detailed description. The Violinist, The Pianist, The Flutist. These figurines are currently for sale on the Olszewski Miniatures website. Description: Using the three masterpieces made for "A Musical Study" Collection, Olszewski chose a very appropriate setting in the Victorian Music Study. 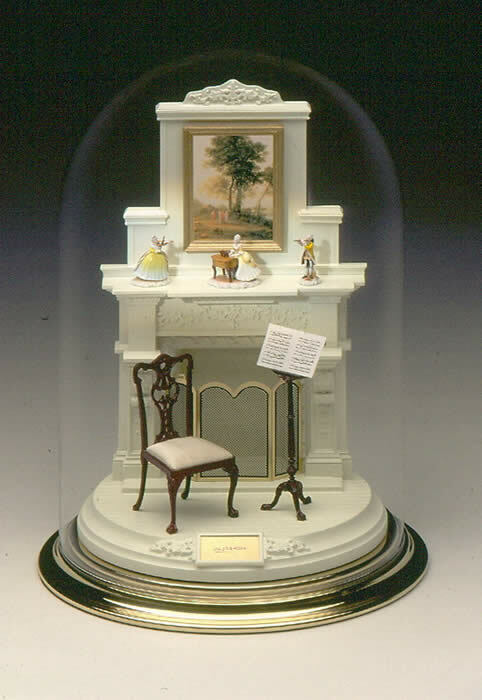 This Fireplace Environment launched with the pieces allowed the collector to change the figurines on the mantel to perhaps coincide with an event or even the seasons. The accessories accented the Study beautifully and included eight separate pieces: The Victorian Chair, Music Stand, Sheet Music, the above the mantel Painting, fireplace screen, a pair of Candlesticks, glass and brass dome, and Fireplace Environment. The eight accessory pieces were not created by Olszewski Studios but were purchased from Miniature Dollhouse market. The whole collection fits and displays beautifully under a glass and brass base dome. See image on left. 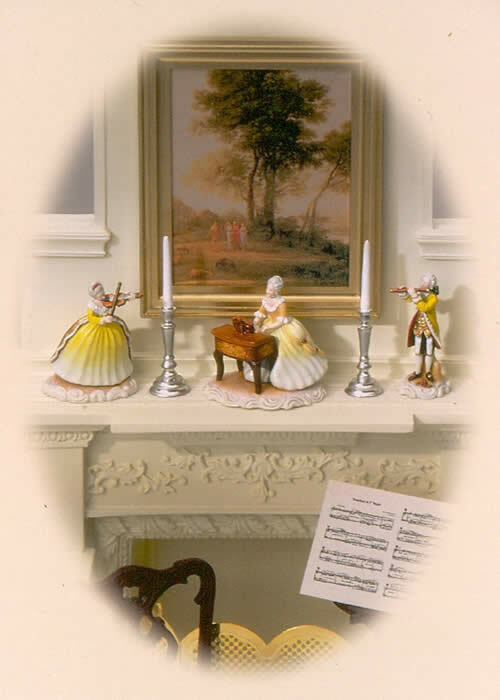 Description: The image on the left is an enlargement of the three "A Musical Study" pieces displayed on the fireplace mantel along with the candlesticks as well as a close up of the sheet music.